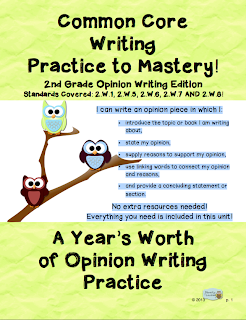 I've got Opinion Writing tackled for the whole year! Grab this new unit at my TpT Store, my Teacher's Notebook site or click here to see how to get it for FREE! Snow Day Productions--Common Core Language Unit! I'm happy to announce the birth of my 3rd Language Practice to Mastery! Unit. That's what I call a productive snow day. :) I didn't do it ALL today...it's been a while in the making. My second graders LOVE these packets! They actually say, "This is fun, Mrs. Shirley!" We call them our Owl Packets. They are making us wise owls! I hope your second graders are enjoying them and learning from them, too! Let your colleagues know there's a product out there that's more than just an assessment--there's a way to master these Common Core standards! I keep my students' packets in data binders as proof of mastery. Let me know how they're working for your kiddos! You can grab this packet at my TpT Store, my Teacher's Notebook site or click here to see how to get it for FREE! Ready to Rock 'n Roll Tomorrow--Common Core Language Unit! Lesson 7: L.2.2.C6 (Concept 6) Contractions or possessives? Lesson 8b: L.2.2.C8b (Concept 8b) Spelling--consult reference materials, including beginning dictionaries, as needed to check and correct spellings. This unit also includes a nice unit test and a Teacher Quick-Check Answer Sheets Section. 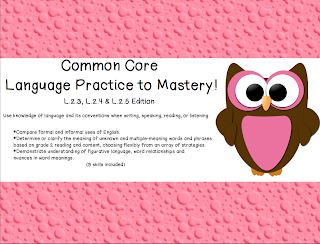 If you are ready to tackle some more Common Core, give it a try! Your students will be mega-prepared for your year-end assessments! Grab this unit at my TpT Store, my Teacher's Notebook Shop or click here to see how to get it for FREE!